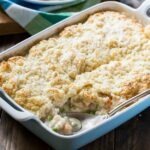 Chicken Pot Pie with Biscuit Topping has a creamy filling with lots of chicken, peas, and carrots and a light and fluffy biscuit topping. Preheat oven to 375 degrees and grease a 3-quart casserole dish. Melt the butter in a large skillet with high sides or a Dutch oven. Add onion and celery and cook until soft, about 6 to 8 minutes. Add garlic and cook 1 more minute. Season with salt and pepper. Sprinkle the 1/2 cup flour over onion and celery and stir for 1-2 minutes. Gradually whisk in chicken broth and then heavy cream. Bring to a boil and add peas and carrots, chicken and thyme. Simmer until thickened. Season to taste with salt and pepper. Pour into prepared casserole dish. To make biscuit topping, stir together flour, baking powder, baking soda, and salt. Cut the butter into the flour mixture using your hands until there are no pieces bigger than a small pea. Stir in buttermilk just until combined. You may not need all of it. You just need enough for all of the flour to be incorporated. Drop biscuit dough evenly over top of casserole. Drizzle with melted butter and sprinkle with Parmesan.